BCAction staff and members deliver nearly 32,000 signatures to Senator Barbara Boxer. Thank you for joining us in demanding strong regulation of toxic chemicals that harm our health. In just one month nearly 32,000 people from across the country signed our Toxic Time is Up petition. 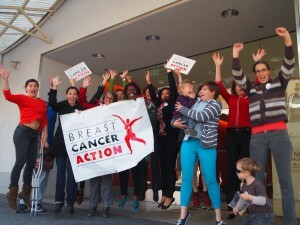 That’s more than 1,000 people per day during October who joined together to demand an end to pinkwashing by removing cancer-causing chemicals from our daily lives. Yesterday was a brilliant, crisp November day and I proudly joined Breast Cancer Action staff and members to deliver all of your petition signatures to the office of U.S. Senator Barbara Boxer. Senator Boxer is the Chair of the Environment and Public Works Committee, which is tasked with updating our current (and broken) toxic chemical policy. 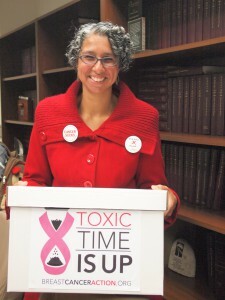 Because of our Toxic Time is Up campaign, Senator Boxer is not only hearing from industry, she is hearing from people living with and at risk of breast cancer as she considers the future of chemical regulation in the United States. BCAction staff and members ready to deliver a strong message to the Senate committee in charge of toxic chemical reform: public health before corporate profit. As we stood outside Senator Boxer’s office, joined by people celebrating the occasion, I was powerfully reminded that we were there to represent the thousands of people affected by the toxic chemicals in our everyday lives: women, children, friends, older women, younger men, women of color, women with different physical abilities, generations who have been harmed by the toxins we all ingest every day, and generations who will benefit by the strong reforms we are demanding. 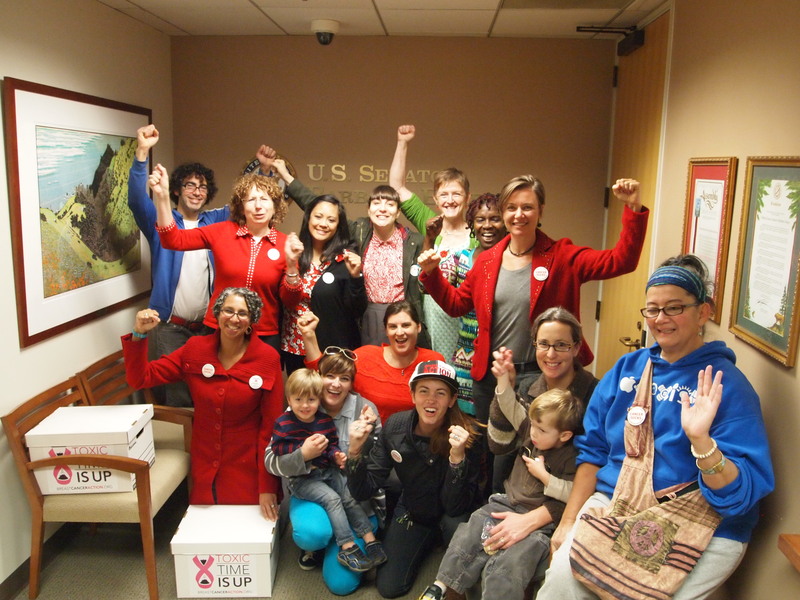 Senator Boxer’s office welcomed us and remarked on how unusual and wonderful it was to see such a large and passionate group. In her follow-up comments, Sen. Boxer outlined many of the principles that we believe must be the centerpiece of toxic chemical reform. And in response, I assure Sen. Boxer and her colleagues that when it comes to strong chemical reform, they can count on Breast Cancer Action to stand up and offer testimony from all of us living with and affected by breast cancer. Toxic Time Is Up was successful because of the help of our allies and partners. Special thanks also go out to the many organizations that have supported this campaign, including Women’s Voices for the Earth, Safer Chemicals, Healthy Families, Breast Cancer Fund, DES Action, Latinas Contra Cancer, Our Bodies, Ourselves, Silent Spring, Green Action, Massachusetts Breast Cancer Coalition, Circulo de Vida, Gayle Sulik, Center for Environmental Health, European Cancer Patient Coalition and Ms. In the Classroom. And we look forward to continuing to work with all of these partners to challenge pinkwashing and demand comprehensive and meaningful toxic chemical reform in the weeks, months and years ahead. Together, we’ve also landed in the media’s headlines, including the Los Angeles Times, Jezebel, International Business Times, Ms. Magazine, Reuters, The Huffington Post, and Truthout. Check out all the media highlights on our news page. Your action this month is a powerful addition to the fight for strong regulation of the toxic chemicals that we are all exposed to in our daily lives. 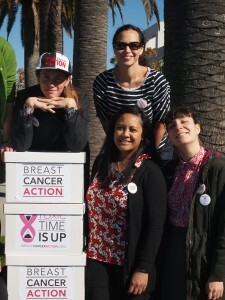 As you know, the struggle is not over, and Breast Cancer Action will continue to demand that decision-makers hear our collective voice and take swift action for public health. I hope that you will stick with us for the next stage of this very important to issue for all of us who care about breast cancer and public health. 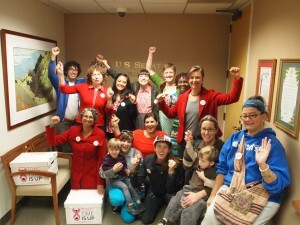 Thank you to everyone who took action to demand an end to pinkwashing and strong regulation of toxic chemicals. ← What, No Cure? There’s Always Next October.